When I met with Leslie Combemale on Wednesday morning, she was cheerful and energetic even though she had been working all through the night. But if your job was to see an early release of Star Wars: The Force Awakens in the middle of the night, and then write a film review before coming to the art gallery that you own, you might have a bounce in your step, too. There are cool jobs, and then there are COOL JOBS. Leslie and her husband, Michael Barry, own ArtInsights, a gallery at Reston Town Center that specializes in film art. They founded the gallery in 1994 and are one of the longest lasting businesses at the town center. 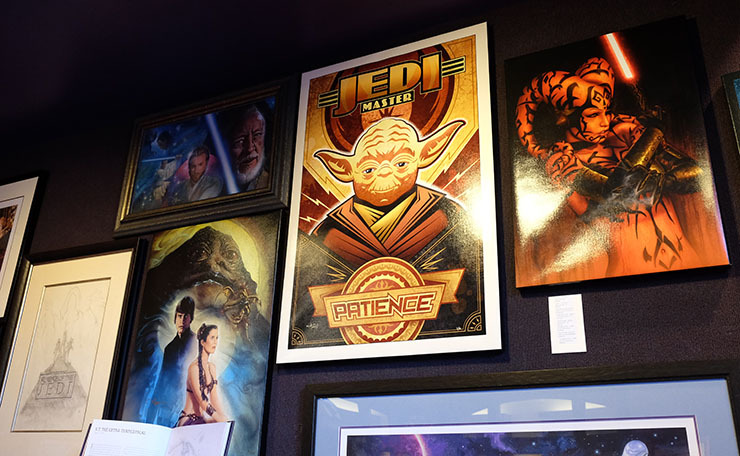 They sell only licensed, official art from movies and animation, created by artists who work at the movie studios. 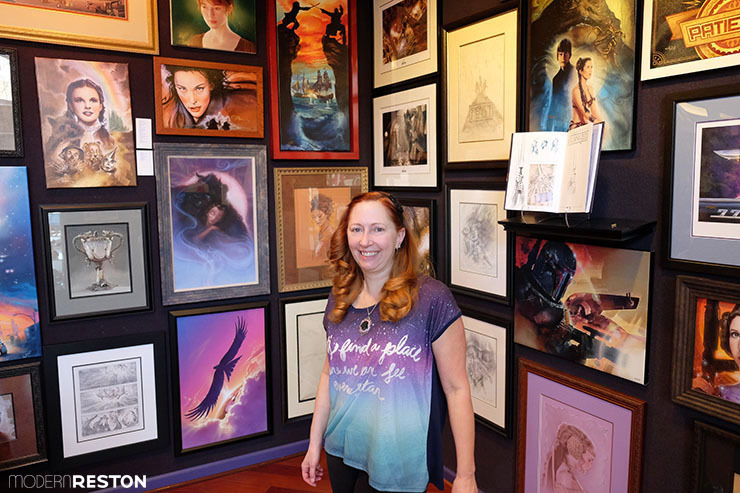 Their collection includes artwork from many of the films you love most, including ones by Disney, Marvel, Dr. Seuss, Harry Potter, Lord of the Rings, and of course the biggest movie of the moment, Star Wars. In celebration of this weekend’s release of The Force Awakens, ArtInsights has an exhibit of original art from the Star Wars movies. 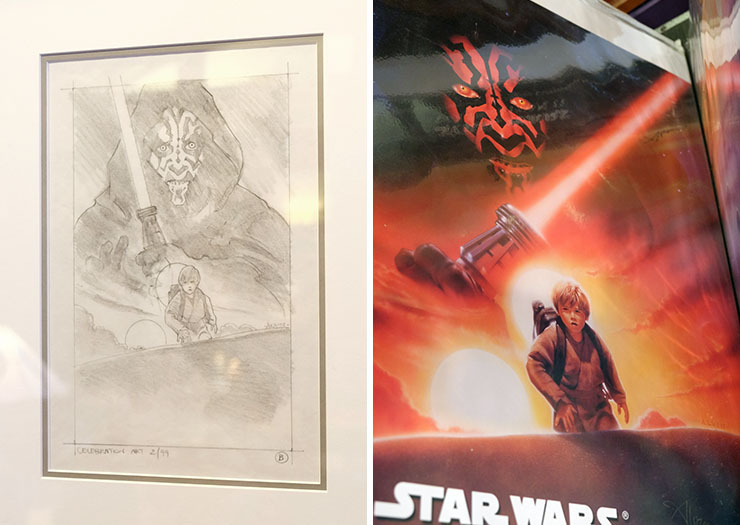 The collection includes drawings, paintings, and prints from the artists directly involved in the production of the movies. 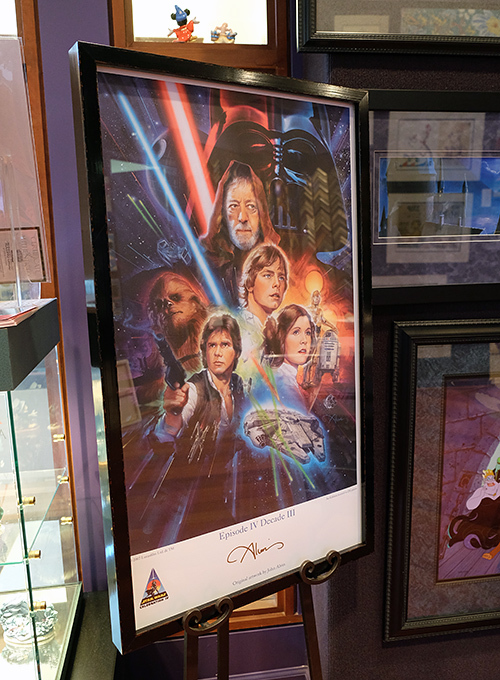 If you want to surround yourself in Star Wars excitement, or if you are looking for a gift for the fanatic in your life, or if you just want to see the work of some of Hollywood’s best artists, check out this exhibit. 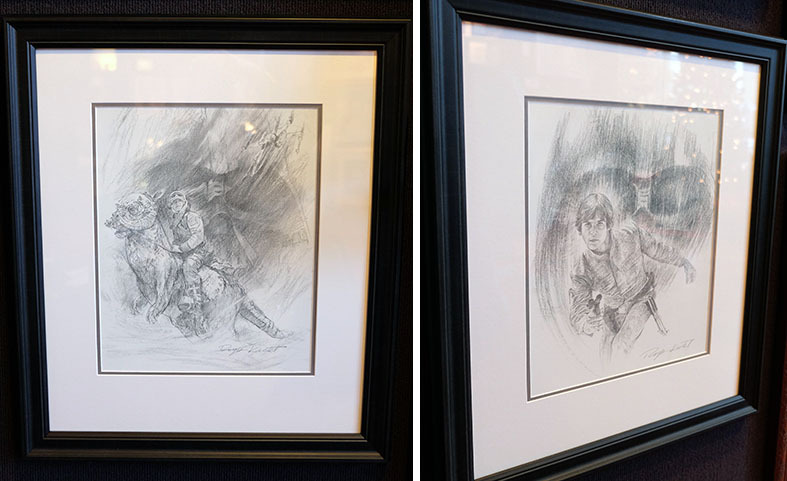 Left: Original drawing by John Alvin for the Star Wars Celebration promotional art. Right: A print of the completed poster. ArtInsights is particularly proud of its collection of artwork by John Alvin, one of the most highly respected movie promotional artists of all time. He created the posters and promotional art for more than 135 films, including E.T., Beauty and the Beast, Victor/Victoria, Blade Runner, the Lion King, and scores of others. ArtInsights has in its collection some rare, original pieces by John Alvin, such as the drawing above. That drawing is available for purchase, but if your budget isn’t exactly grand, you can buy a licensed print of the completed poster instead. Another impressive piece is this poster for Star Wars, signed by John Alvin himself. It is an official lithograph that was limited to an edition size of 250. It is sold out everywhere except here. This exhibit also includes works by artists Roger Kastel, a renowned illustrator who created the original Empire Strikes Back poster, and Michael Kungl, a famed graphic designer and illustrator who is known for an art deco style. 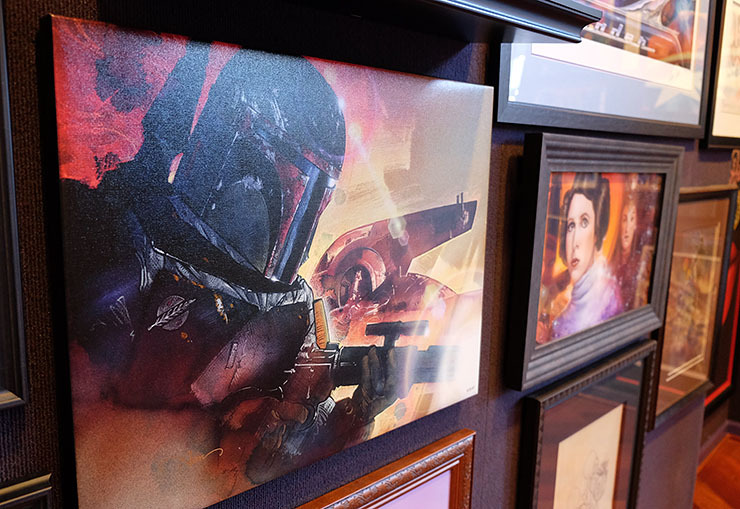 All the artists included in the exhibit have worked directly with the movie studios, and the artwork is officially licensed by the movies. Leslie also showed me some of their most recent additions: artwork from the newest movie, The Force Awakens. “These characters will be more exciting to people once they see the new movie,” Leslie added with a knowing grin, clearly still giddy about the advanced screening of the film that she’d seen at 3am earlier that morning. Leslie had even dressed the part that day, with a Darth Vader necklace and some fab shoes. (And amazing red curls, if I may add.) 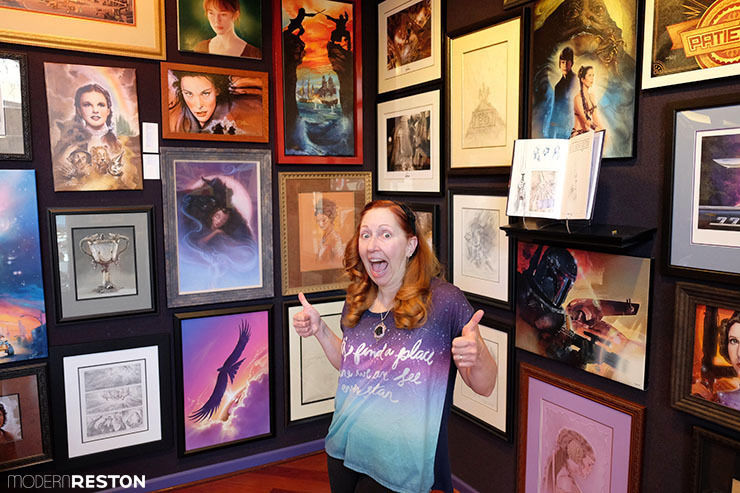 She is such a fun character who clearly loves her job, and her gallery brings something special to Reston. It’s easy to look around Reston Town Center and assume the area is merely a series of ubiquitous chain stores, but if you look closely you’ll discover more. Dispersed among the mall stores are independent businesses that add unique culture to the Reston area. ArtInsights is absolutely one of those places. “Years ago, before the Town Center had coffee shops, people used to bring their coffee from home and just sit in our gallery,” Leslie told me, perplexed. Sure, that’s weird, but I get it. There is something warm, inviting, and familiar about ArtInsights. In some galleries, artwork can be difficult to comprehend and specific to an artist’s perspective. At ArtInsights, though, I instantly felt a personal connection to the artwork. The characters from beloved movies stirred my own memories, and browsing them felt like visiting chapters of my life. Leslie described it as “a five-star flick that deserves to crush every box office record built around the world.” I’ve already contributed to those box office totals, and now I’m even more excited to see it. It sounds like the Force is strong with this one. But first, I need some of those shoes. 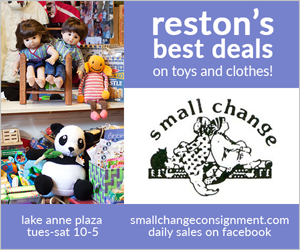 ArtInsights is located at Reston Town Center at 11921 Freedom Drive, Reston, VA 20190. They are open from 10am-5pm most days, and by appointment. Prices range from $50 to tens of thousands. Several original paintings are available for just $125. They also offer skilled, custom framing at competitive rates. I love this! Anyone who hasn’t had a chance to go check out the gallery should definitely head over. It’s a wonderful place to geek out about the shows and films and characters you love, and Leslie and Michael are wonderful and incredibly knowledgeable. It’s worth stopping by just to learn something new and fascinating.